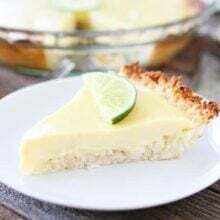 Key Lime Pie with Coconut Macaroon Crust-the sweet coconut macaroon crust makes this key lime pie extra special! Josh isn’t a huge dessert fan, I know, what is wrong with him? 🙂 He loves lime desserts though. I am always trying to come up with new lime recipes for him. A few of his favorites include: Key Lime Pie, Key Lime Tart, Coconut Lime Cupcakes, Lime Bars, and Lime Coconut Snowballs. He is a lime lover! I wanted to mix things up this year so I created a coconut macaroon crust to go with his favorite key lime pie filling! Josh loves coconut too so I knew he would love my twist on the traditional key lime pie. And you really can’t go wrong with the coconut and lime combo! They are a match made in heaven! To get the pie party started, I used my favorite coconut macaroon recipe. Instead of making cookies, I pressed the coconut mixture into a pie pan! I wasn’t sure it would work, but my fingers were crossed:) I partially baked the crust so it would set up a bit before putting in my filling. Next, I whisked up a tart key lime filling to go inside my sweet coconut macaroon crust. I baked the pie and pulled it out! It looked perfect! The crust was light golden brown and the key lime filling was smooth and set! I let the pie chill in the fridge for about an hour and then it was time to slice the pie…and see if my new creation worked:) The pie sliced beautifully! I gave the first slice to the birthday boy and he didn’t hesitate to dig in with his fork. He loved the pie! Yahoo! My new lime dessert was a success! 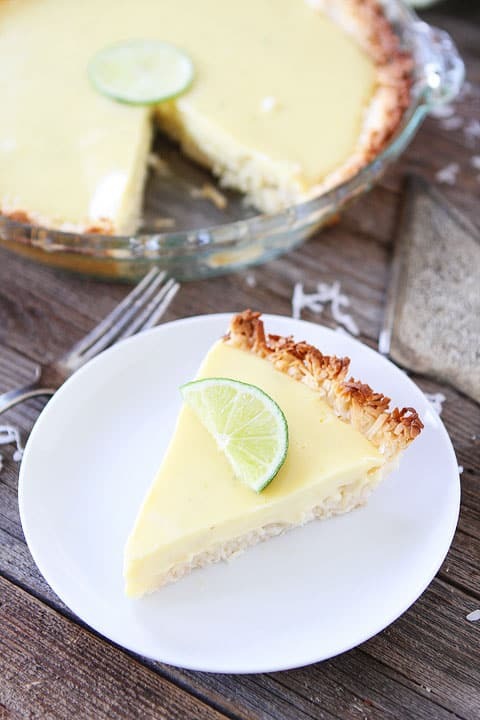 Key Lime Pie with Coconut Macaroon Crust is a fun twist on the classic pie! It is fun to mix things up every once in awhile! We love this pie and I think you will too! Enjoy! 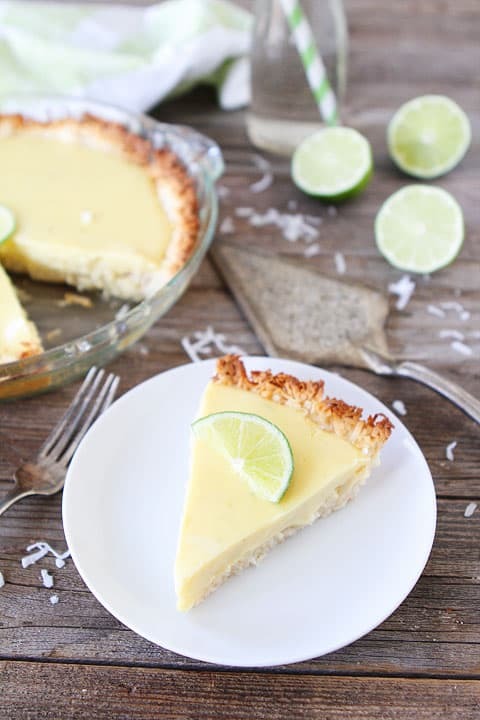 Key Lime Pie with a sweet coconut macaroon crust! The lime and coconut combination is a winner! We love this twist on the classic pie! Preheat the oven to 350°F. Spray a 9-inch pie pan with non-stick cooking spray. Set aside. First, make the crust. In a large bowl, stir together the sweetened condensed milk, egg white, vanilla extract, and salt. Stir until combined. Add in the coconut and mix well. Press coconut mixture into prepared pie pan. Make sure you press the mixture up the sides to form a nice pie crust. Bake for 10-12 minutes. Remove from oven and let cool. 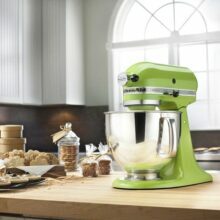 To make the key lime pie filling, in a medium bowl, whisk together the sweetened condensed milk and egg yolks. Whisk until well combined. Add in the lime zest, and lime juice. Whisk until smooth. Pour filling over the coconut macaroon crust. Bake for 15-17 minutes, or until filing is set and the coconut crust is golden brown around the edges. Remove from oven and cool on a cooling rack. When cool, chill the pie in the refrigerator. The filling will set up as it cools. Chill for at least one hour before serving. Note-if you can't find key limes you can use regular limes for the juice. You can also use bottled key lime juice if you wish. This pie looks really, really good! Perfect for a hot summer day! What a beautiful pie! Pinned! It looks so refreshing! HAPPY BIRTHDAY JOSH!!!!!!!!!!!!!! I love your key lime bars, so I must make this. You know my Josh is a key lime fan too. LOVE the looks of the crust! Happy birthday John! My hubby isn’t a big dessert fan either. He always complains when I develop too many cookies or sweet recipes. I dont understand. This is GORG! Love key lime and coconut! Pinned! I love key lime pie so I think this is amazing! I think you might have something here. Time to buy limes! 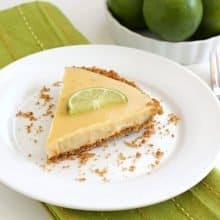 What a great way to change up key lime pie. Happy Happy Birthday to Josh! Have a wonderful weekend! The pie looks to die for! Happy Birthday Josh! Today is my birthday too! I think I need this key lime pie to celebrate today . . . it looks amazing. Yum! WOW! I’m so excited for summer pies and this is the perfect way to kick things off! Oh, Maria. This looks fantastic. 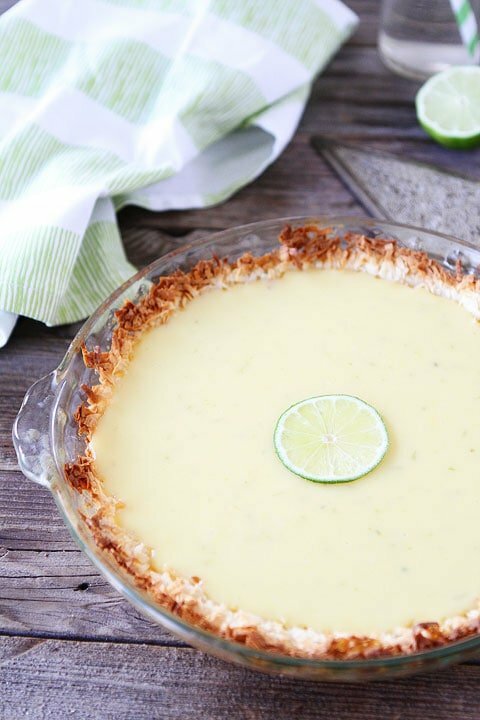 Love the coconut macaroon crust with the key lime! omg this looks amazing! key lime pie is my favorite dessert too. I love that coconut macaroon crust! What a perfect summertime treat. What I wouldn’t give for a slice! Love the coconut macaroon crust!! Genius! This is pretty much my dream pie Maria. Key lime pie mixed with a macaroon is s seriously heaven in a slice! Brilliant combo of macaroons and key lime – can’t wait to try it out! In love with that crust! 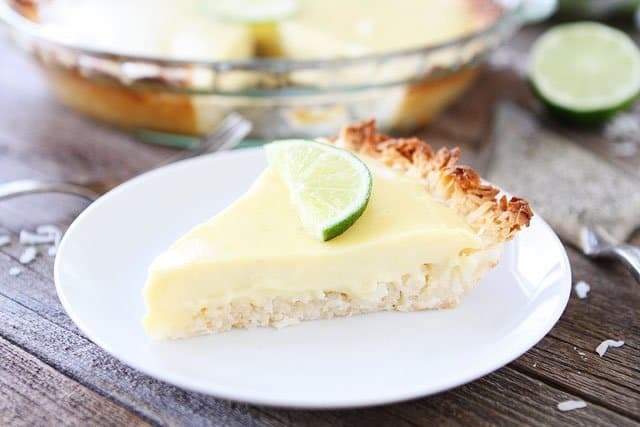 This key lime pie looks wonderful! Happy Birthday to Josh…he’s very lucky to have such a delicious treat to celebrate his birthday. Thanks for sharing! A very happy birthday to Josh and I would like this pie all to myself! Totally genius! Love the twist! Also, happy birthday to Josh and good luck with your parties! Happy Birthday, Josh. Happy Mother’s Day, Maria. 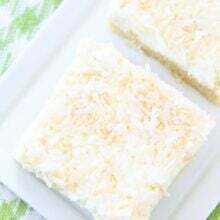 The coconuts are brilliant and this is a very beautiful and clean recipe. We use coconuts often in our women’s group, we also use the cold pressed 100% coconut oil for cooking. One woman actually lost weight by including coconuts into her meals. Thanks so much for the gluten-free recipe, as my husband has celiac disease. However, some of our friends are lactose-free too. Is there a substitute for condensed milk? Thanks! Beautiful pie, love the coconut crust! Your emails have stopped coming to me:( I signed on again and still no emails. The recipe looks good. But Key Lime Pie, is supposed to have Key Limes in it. I loved the scones you did on the today show. It was neat seeing you. I tell everyone I know a celebrity. Gorgeous Pie! A coconut crust ….What?! Love it! Happy Birthday Josh! 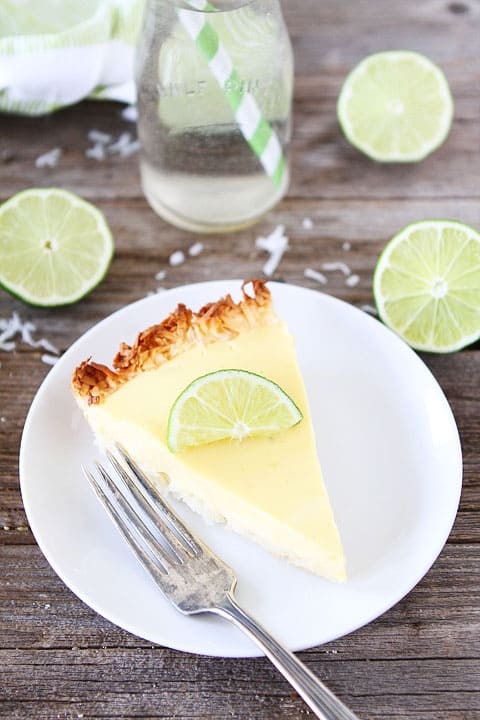 Your Key Lime Pie looks great! I have an old recipe for Key Lime Pie that is made with separated eggs and whipped cream. It creates a very light and airy pie with a nice tang. I have never seen this recipe in any book or website. The book I found it in was printed in Australia. I have cut down on the sugar, made it with Splenda and low cal whip topping. It keeps on turning out great. I’ll have to try your crust, I love coconut. Love the coconut macaroon crust idea! Lime and coconut = Mmm! Great spring or summer dessert! GREAT idea for a macaroon crust! Can’t wait to try this out! Extra Happy Birthday Josh, because you are the impetus for this recipe. I tagged this recipe even before I read it. I KNEW it was a winner. And boy howdy did my theorgy get substantiated after I read the recipe. A stunning simple dessert. Oh this is awesome! I totally agree, you definitely cannot go wrong with a lime and coconut combo! I made this pie for Mother’s Day and I must have done something wrong. I pre-baked the crust but it was waaayyyy to thick and wasn’t done. I was so disappointed. The filling was really good although I was a little heavy handed with the green food coloring. My grandkids thought it was funny. Maybe I’ll try again. 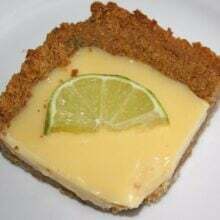 here in Brazil we have a really traditional lemon pie, and the filling is done with the ratio of the juice of one lemon for can of condensed milk. The juice and the condensed milk transform in some kind of mousse, and you don’t have to cook it! kudos for the recipe, I loved it! What a very cool twist! Please send recipe, Mariana? Can’t wait to try this! Do you think the crust would work with unsweetened coconut to cut the “too sweet” taste? Well I have just died and gone to HEAVEN!!! This is beyond, well, beyond!! the coconut crust is a great idea. yum! Today is my birthday and I’m making this for myself since my wife doesn’t like coconut. Can’t wait tot try it! Why no key limes? This is a Persian lime pie. Very different taste, but it looks good. I’d just change the name. Love the simple idea of this recipe. However it seems that macaroons were forgotten in the actual instructions. So I cut the sweet milk in the crust and used regular milk. Then used unsweetened coconut. Glad I did since even doing this it was a super sweet pie. The consistency was great. I will try coconut milk all around next time and more lime. There are no macaroons in the recipe. The coconut crust is like a macaroon cookie! How “done” should the bottom of the crust look? I just made it and the sides have the browning on top, but the bottom looks a little gooey….should I leave in the oven longer? Can this be made like a bar in a 9×9 square pan? I haven’t tried it but I am sure it would work just fine. How old is josh now? I am quite curious? I’ve made a few recipes from your site with success, but feel this one was a flop. No offense, but it’s annoying all these reviews read “this looks soooo good” without any actual review by readers making it. The coconut macaroon crust baked up without any real change in consistently from when it was pressed into the pan (except the top did get a nice crunch to it). The taste was also impeded by the constant chewing of coconut shreds. The filling definitely didn’t call for enough lime flavor so it fell flat there. condensed milk pie with coconut shreds. Hi – this looks great! I’m a bit confused about you adding the condensed milk twice though? (Step 2 and Step 3). Is that a mistake? Oops I read it properly – ignore me! I wonder if you used coconut milk instead of condensed milk if it would still work – it would cut some of the super sweet taste? I love this idea though. Just made a key lime pie with graham cracker crust today for Easter so it will have to be next time. Thanks for the great ideas! Condensed milk is thicker and creamier,regular coconut milk might not be thick enough. Can’t wait to make & try this! I am on a strict dialysis diet, what are the nutritional facts? Particularly sodium, phosphorus, and potassium content. was wondering if I could sub lemon for lime? Yes, I am sure lemon would be good too! I really was craving a citrusy hit when this recipe came across my FB feed. Luckily I had a couple tins of condensed milk in the cupboard and a bag of coconut in the freezer. While I was really happy with all the flavours, I have one comment – for me, there was just a touch too little filling for that amount of crust. Possibly double (or at least 1.5x) the filling would do the trick. We don’t get sweetened coconut here in South Africa, so I didn’t find the pie too sweet. I’ll definitely make it again! If I want to cut back on the sweetness, can I use 1/2 unsweetened coconut milk and 1/2 sweetened condensed milk? I really like this recipe though compared to others I have seen. I like your other recipes and your style of cooking! Has anyone attempted to freeze it. I am considering it for some desserts at a casual outdoor wedding reception, and will need to bake a few days before. Can it freeze and thaw? Excellent, key Lime Pie. I can see why it is your hubby’s favorite, and so easy to make. I will try a Lemon Pie if you have one. Thank you and continue cooking. God Bless you and your beautiful family.